Raw banana chips/Vazhakkai chips is a very easy to make homemade chips unlike potato chips.My MIL makes it very often for puliodharai.But my mom makes it only for Sodhi kuzhambu.Last weekend i prepared tirunelveli style sodhi,ginger pachadi,potato poriyal along with this vazhakkai chips for our lunch.We had a nice tirunelveli saapadu after a long time.I usually make deep fried version for Raksha and baked banana chips for myself and Sendhil.I will make a separate post for baked chips.Both mom & MIL follows this method for deep frying banana chips.Its a very easy one.Even a beginner can try ! 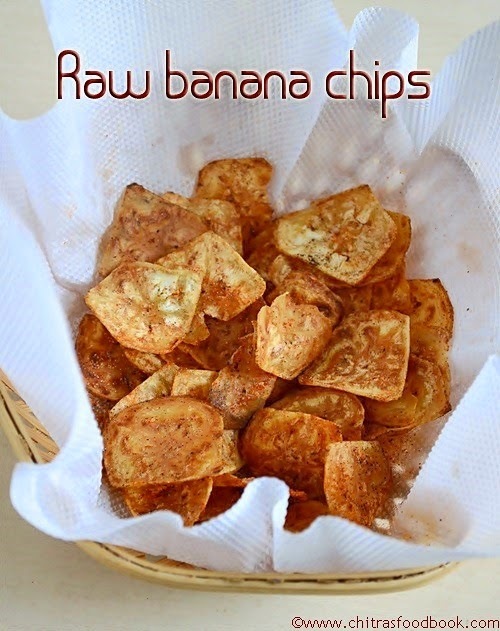 Ok,Lets see how to make this green banana chips at home easily . Vazhakkai chips/Raw banana chips recipe - Homemade,easy to make! Wash and cut the banana into two horizontally.Keep immersed in water till use to avoid discoloration.Take a thin mandoline slicer.I use Everest brand slicer.Heat oil in a kadai to deep fry. Once the oil is heated,check it by dropping a small piece of vazhakkai.If it rises to the top immediately,oil is heated.Now simmer the flame completely and carefully hold the slicer in one hand few inches above the kadai.Slice the banana directly in the oil.Make sure the slices are thin and even. After u sliced a batch,increase the flame to medium high and leave the chips for few seconds.Then flip it. Cook till the bubbles and ‘sshhh’ sound ceases completely.Adjust the flame as & when needed.Keeping the flame high continuously burns the chips.So take care. In the mean time,mix red chilli powder and salt and set aside. Remove the chips in a tissue paper and drain the excess oil. Transfer it to a plate or bowl and sprinkle the chilli powder+salt mix. Serve with rice or as an evening snack with coffee or tea !! Store the remaining in an air tight box.Its shelf life is one week. U can use pepper powder in place of red chilli powder. Some people slice the bananas, keep them immersed in water and then deep fry in oil.In that case,u should pat dry the banana slices in a towel else it chips won’t come out crispy and sometimes color may change into black. Do not fry the chips in high flame.It changes the color of chips. Fry all the chips uniformly.Even if u make one batch soggy,it will spoil all the batches. Store in a box only after the chips is cooled down. 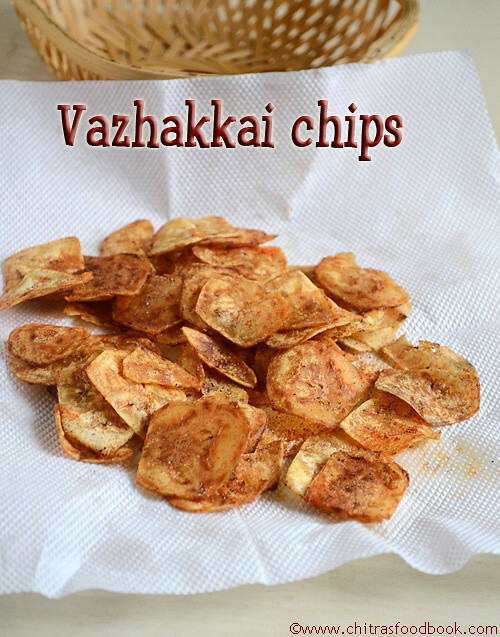 Enjoy crispy vazhakkai chips with coffee/tea or with variety rice !! looking very crispy and yummy..
Crispy and tempting snack !!! Wow tasty and crispy chips. Crunchy crispy chips, ur click is so tempting.